On December 21st, Pepe had a bad fall in the early morning. I often check on the Three-Cans throughout the day through our kitchen window and luckily happened to peek out at them in the nick of time. Because I couldn’t see Paz or Pepe, I went outside to investigate and was fortunately able to intervene just as Paz was about to attack Pepe, who was motionless on the ground on his back, unable to defend himself. If I hadn’t stepped in when I did, I’m pretty certain she would have killed him. It was an incredibly scary moment, not just due to her aggression, but also because I have never seen Pepe so helpless – for a few breathless beats, I thought he was already dead. Thankfully, he was not, but my concern quickly evolved as he didn’t recover as fast as he usually does after a fall. This time, he couldn’t even hold himself up on a perch initially without me holding his body upright. If you have been following Pepe’s story, you probably remember that falls aren’t new to him. He has always been our clumsy-can who’s had inexplicable balance issues since we adopted him – but this time was much worse than anything we’ve experienced with him thus far. Once he was able to perch again, we realized that he was not going to be able to remain safely in his aviary without injuring himself further in his weakened state. We brought him into the house in his crate and he’s been in here recovering ever since. We are beyond grateful to our wonderfully caring vets who have had to make several trips to visit Pepe since the fall. At first, he resisted drinking and had to have fluids pumped into him several times to keep him hydrated. They have also taken extensive x-rays which show no signs of fractures or breaks. He shows no signs of infection and his blood results indicate only slightly elevated liver enzymes, which apparently, can mean a number of things when it comes to birds. Pepe is now back to eating, drinking, and otherwise behaving normally with the exception of his mobility. His ability to balance and move about remains very limited – we have to keep a close watch on him all day because when he falls, he still cannot manage to turn himself over from his back without our assistance. It’s heartbreaking and also so frustrating to not know what exactly is wrong with him, leaving us unable to proactively “fix” him. The Three-Can’s past is a complete mystery to us so information that would be incredibly helpful in Pepe’s diagnosis remain unknown such as his age and medical history. The vets are cautiously optimistic. It’s still inconclusive whether it’s really Hemochromatosis, the iron storage disease common to toucans, as it can only be definitively diagnosed through a liver biopsy. We are currently treating him with some anti-inflammatory medication that may give us some more answers about his future, depending on how his body reacts to it. We are able to let him out of his crate for periods throughout the day onto some low perches we have arranged for him in the house. It is nice to see him bright-eyed and perked up a bit more like his old self again, but unfortunately, his brain is at a level his body is not. He still attempts to fly off and make jumps he is not ready for, so we are having to guard his out-of-crate time closely, in an effort to prevent any further injuries. Our current situation with him living in his crate in the house is not ideal for any of us. While Paco would relish in all of the extra attention, Pepe is a bird-bird, preferring the company of his toucan flock to us humans. He also craves the outdoors and is constantly yearning for it through the windows, in hopes that he can return outside. In his current state, with no recent signs of further improvement, we feel it would be too dangerous to allow him to live in his old aviary – it is simply too large and too high. And, as sad as this is, it is also pretty definitive that he cannot live with Paz ever again either. She has always been so much bigger and stronger than him and if we are really being honest with ourselves, she was probably never a good match for Pepe mobility-wise in the first place, even when he was at his personal 100%. At this point, it has been almost three weeks and we’re ready to accept his situation as a potentially lasting way of life that needs to be accommodated. We have started exploring our options in building him an altered aviary which would prevent him from falling from great heights. We are also working on some ideas for a larger indoor enclosure for him to live in for now, in place of the crate, as he still needs to be closely monitored. I sure wish there was someone out there who could provide some clarity – it is exhausting not knowing what exactly to do! In the meantime, just keeping calm and carrying on. I’ll keep you updated with what we learn and Pepe’s continued (hopefully) improvement. 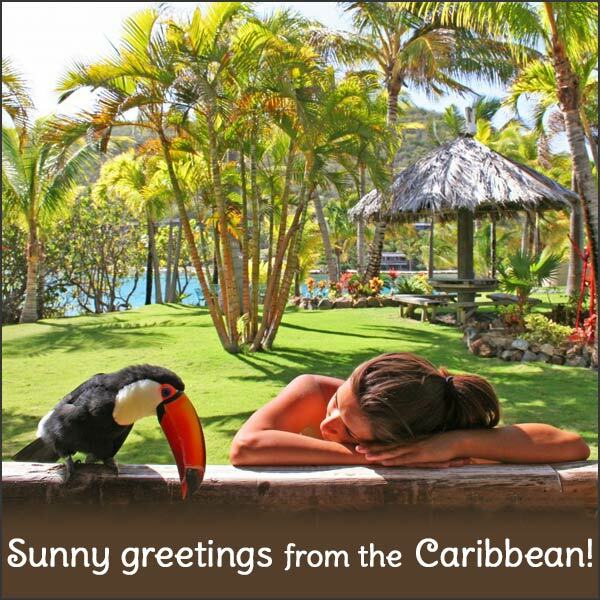 This entry was posted in Care, General Info and tagged 3cans, Adventures in Toucanland, bird, birds, BVI, disabled, exotic, exotic birds, exotic pets, exotics, hemochromatosis, injured, island, Paco, Paz, Pepe, pet, pet bird, pet birds, pets, Saba Rock, Three-Cans, Toco, Toco Toucan, Tocos, Toucan, Toucan Lady, ToucanLady, toucanland, toucans, tropical birds, tucan, tucans by Toucan Lady. Bookmark the permalink. Please I really want a tocan as a pet.it is a furry and a cute bird from Brazil,south America. It’s always so devastating when animals get sick and we can’t figure it out. I sure hope Pepe gets well soon, for your sake as well as his. Oh, Chrissann, I am so sad to hear about Pepe. The fragility of our beautiful companions can be heartbreaking. I’m glad that Pepe lives where he is loved, respected and understood. That’s all we can offer our big-beaked friends during the time we have together. You are a superhero of the pet-toucan world, and I’m confident you will do the right things. Pepe is so very, very lucky to have you. Sending hugs from San Francisco, Tonia. Hi Chrissann, poor Pepe! Have you contacted Jerry Jennings to get some insight?? He is so knowledgeable on all Toucan issues!! He has helped me so many times, including once when Yoshi got his foot band caught on his cage. I came home to find him hanging and bleeding…it was horrifying and he too was listless initially. I think he was exhausted from trying to pull himself up (we have no idea how long he was there hanging since both my husband and I were at work). He checked out ok from the vet and they gave us an antibiotic for his cut on his foot. Jerry and the other members of the group were so helpful though in his rehabilitation. We kept him in his crate also for a couple of days until he had the strength to perch. It did take a long time though for the swelling to go down and for him to be 100%. Hopefully, Pepe will continue to recover. Maybe he is just old and needs more time, I hope so! Keep us updated on his status…best wishes! !